This event is NOT going to take place on April 11. Given the still fluid Brexit situation, the event has been postponed. We will update you as soon as we have a new date. The ramification of restrictive business immigration policies here in the U.S. have never been more profound. In the U.S., employers of foreign national professionals face unprecedented denial rates, delayed processing times and a deluge of anti-business immigration rhetoric coming out of the White House. 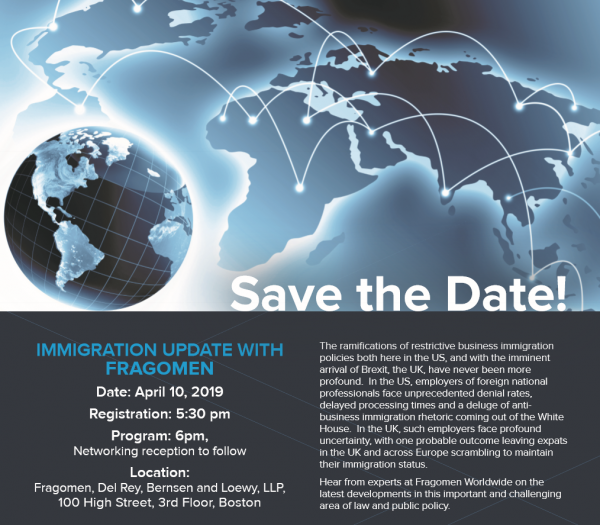 Hear from partners at Fragomen Worldwide on the latest development in this important and challenging area of law and public policy. As this is also a very relevant topic to our membership, BABCNE kindly extends free admission to GABC members, but RSVPs are required. Please email us your name at info@gabc-boston.org, so we can add you to the guest list. Admission for non-GABC members is $35. You may register through our portal.